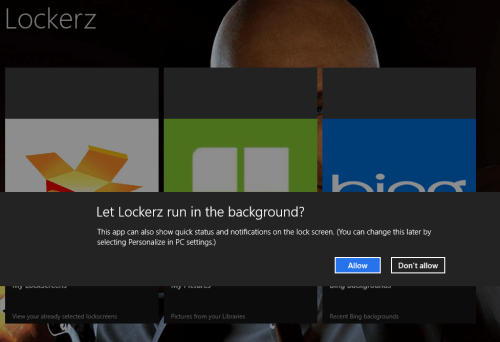 Lockerz is an advance Windows 8 app to change lock screen on your machine. The main highlight of Lockerz is that it lets you define a set of images/wallpapers to be used on Windows lock screen. Those images will swap after a set interval of time i.e. the image on your lock screen will change automatically in background. 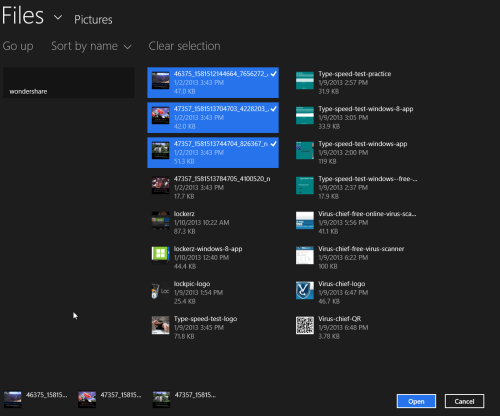 This means that Lockerz Windows 8 app to change lock screen is quite dynamic in comparison to many similar applications. Here, you are delivered the option to use local images or the latest wallpapers by Bing. On launching Lockerz Windows 8 app for the first time you will be asked about allowing it to run in background. You must click on ‘Allow’ button to proceed. Next, you will be presented three large buttons stating ‘My LockScreens’, ‘My Pictures’, ‘Bing Background’. On clicking on ‘My Lockscreens’ button you will find nothing. You can begin with a click on ‘My Pictures’ button to access the images stored locally in Pictures Library. After click, you’ll be the presented the list of available images. 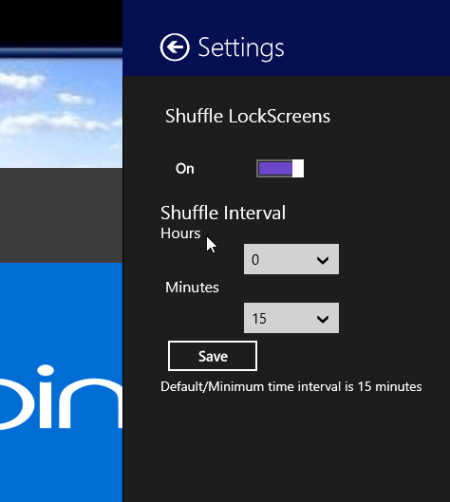 Then you require selecting the ones which you would like to set as background for Windows lock screen and click on ‘Open’ button. The images will now be added to ‘My lockScreens’ section and can be easily managed from there. If you want to add Bing backgrounds, then on home screen click on ‘Bing’ button after which you will be taken to a window with latest Bing Backgrounds. Then select interesting ones followed by a click on ‘Add to LockScreens’ button on the horizontal bar at bottom. Once you have specified the images then go to the home screen and click on ‘My LockScreens’ button after which you will be presented the list of selected images. There you can select an image and choose to set it as lock scree or delete from the list. One last thing you can do is to select settings from Windows Charms Bar to automatic shuffle in the enable/disable shuffle. Then click on ‘View in Windows Store’ button followed by a click on ‘Install’ button. (Both in top-left section of respective interfaces). Lockerz Windows 8 App To Change Lock Screen is quite nice. I have no issues in recommending it. LockPic is another good app with similar features.